THE MINISTER FOR Finance has said the Central Bank may be forced to take action if there is no improvement in diversity in the senior posts at Irish banks. Speaking in the Dáil, Paschal Donohoe said this diversity extends beyond gender to include diversity in “personality types, educational background, ethnicity, and diversity of thought”. In responding to a question by Tommy Broughan TD, Donohoe referenced a 2018 report which pointed to a severe gender imbalance in the financial services sector. The report found that 80% of the senior appointments between 2012 and 2017 were men. 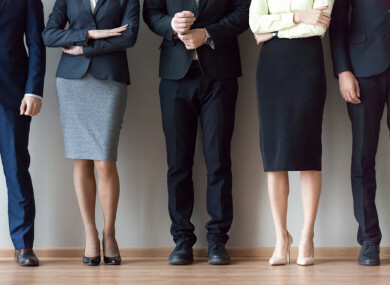 In the most senior roles the gap was even more stark, with women comprising just 12% of applicants to the boards of Irish financial institutions. The report noted that there have been some improvements in recent years, with the percentage of senior appointments in 2017 increasing to 29%. In the assessment, the authors noted a lack of diversity can lead to “the risk of over-confidence in decision-making” and a “reluctance to change”. In his Dáil reply, Donohoe noted that senior officials in the Central Bank have continually addressed the topic directly with bank officials “through a comprehensive series of speaking engagements” but may have to do more. “However, in the absence of improvements in diversity at senior levels in regulated firms, the (Central) Bank will consider whether it is necessary to introduce further requirements,” he said. Email “Paschal Donohoe says the Central Bank may take action if diversity at banks doesn't improve”. Feedback on “Paschal Donohoe says the Central Bank may take action if diversity at banks doesn't improve”.